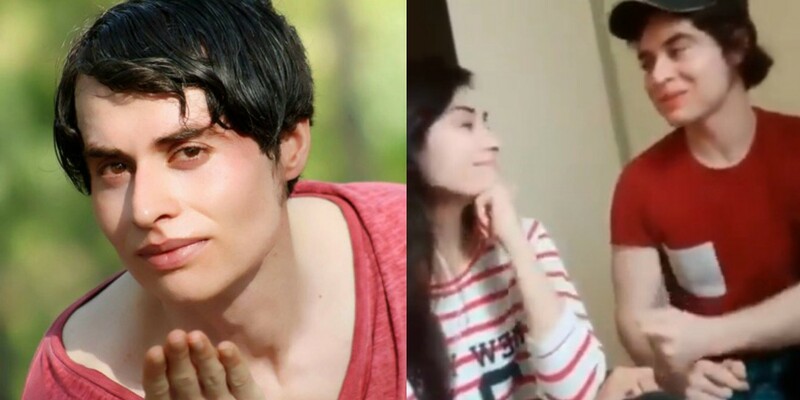 Nasir Khan Jan Found A New ‘BAE’ And Every Guy Out There Is Jealous! Who doesn’t know Nasir Khan Jan? He loves to do what he loves without thinking ‘Log Kya Kahenge’. Nasir Khan Jan is a brilliant example of sheer confidence! The way he chose to become a social media sensation in Pakistan is totally out-of-this-world, but he succeeded! From stuffing a cake in his mouth during live videos to challenging Lata Mangeshkar, from showing his dance moves to releasing hilarious birthday wishes on requests, Nasir Khan Jan is an internet sensation for many reasons. Nasir Khan Jan’s harmless videos are just regarded as a source of entertainment and laughter by those who follow him. It seems like he drops a bombshell every now and then to stay connected with his followers. The same thing happened yesterday when Nasir Khan Jan’s video clip of fifteen seconds with a girl went viral. In the background, some romantic song is playing while Nasir Khan is just lip sync and moving his hands back and forth. Check out this video. Man, the way he looks at her! Here Is How People Reacted To Nasir Khan Jan’s Latest Video! – Yes, Bro, We Are Still Single As AF! – Na Bhai Na Allah Na Kare! – Doob Marne Ka Maqam For All The Singles! – Pehle Amir Bhai Or Ab Nasir Khan Jan, Bohat Na-Insafi Hay Rey! – Time To Leave The Planet! – Yes, Bro, You Are The Only One! – Ami Kehti Hain Aisa Nahe Kehte! Although, it is still not confirmed that whether the girl is his girlfriend or it is just a publicity stunt as always. But all the single people are not happy at all with his latest video. Seriously Yaar, Sad Hona To Banta Hai Na? So, guys, what do you think about Nasir Khan Jan? Does his antics entertain you or offend you? Share your thoughts with us in the comments section! WTF?! The New Momo Challenge Is Literally Freaking Everyone Out! Federal Board Intermediate Results are here and PGC students have outdone themselves!